Related fishing news and updates is for a quick reference for the latest news available for your fishing trip. Below is a map with all the marine areas. Salmon will open from June 22nd-September 30th, 7 days a week. Limit per day is 2 Salmon, 1 of which may be a Chinook. Coho must be hatchery. The state's 2019 salmon fishing seasons, developed by the Washington Department of Fish and Wildlife (WDFW) and treaty tribal co-managers, were finalized today during the Pacific Fishery Management Council's (PFMC) meeting in Rohnert Park, Calif. This year's fisheries were designed to take advantage of a higher number of coho salmon forecast to return to Washington's waters as compared to recent years, said Kyle Adicks, salmon policy lead for WDFW. However, projected low returns of key chinook stocks in Puget Sound prompted fishery managers to restrict fisheries in Puget Sound. "We're able to provide more opportunities to fish for coho in some areas, particularly in the ocean and Columbia River, than we have been able to do for several years," Adicks said. "But continued poor returns of some chinook stocks forced us to make difficult decisions for fisheries in Puget Sound this year." "We expect some good opportunities for fishing in the ocean this summer," Adicks said. For 2019, PFMC adopted a significantly higher quota for coho, and a similar quota for chinook compared to last year. All four of Washington's marine areas will open daily beginning June 22. "Reducing fisheries is not a long-term solution to the declining number of chinook salmon," Susewind said. "The department will continue working with the co-managers, our constituents, and others to address habitat loss. Without improved habitat, our chinook populations will likely continue to decline." Anglers will also have limited opportunities to fish for pink salmon in Puget Sound due to projected low returns this year. There are no "bonus bag" limits for pink salmon in 2019. "While we anticipate a robust coho fishery in the Columbia River this year, we're taking steps to protect depleted runs of chinook and steelhead," Adicks said. Notable changes to this year's Puget Sound sport salmon fisheries can be found on WDFW's website athttps://wdfw.wa.gov/fishing/management/north-falcon, where information on recreational salmon fisheries in ocean waters and the Columbia River also is available. VANCOUVER, Wash. – Fish managers have developed options for Washington's ocean salmon fisheries that reflect concerns over chinook stocks and optimism about improved returns of coho projected this year. The three alternatives are designed to protect the low numbers of chinook expected to return to the Columbia River and Washington's ocean waters this year, said Kyle Adicks, salmon fisheries policy lead for the Washington Department of Fish and Wildlife (WDFW). "With these alternatives in hand, we will work with stakeholders to develop a final fishing package for Washington's coastal and inside waters that meets our conservation objectives for wild salmon," Adicks said. "Anglers can expect improved opportunities to fish for coho salmon compared to recent years while fishing opportunities for chinook likely will be similar to last year." Similar to 2018, this year's forecast for Columbia River fall chinook is down roughly 50 percent from the 10-year average. About 100,500 hatchery chinook are expected to return to the lower Columbia River. Those fish – known as "tules" – are the backbone of the recreational ocean fishery. State fishery managers are working with tribal co-managers and NOAA Fisheries to take into account the dietary needs of southern resident orcas while developing salmon fishing seasons. The declining availability of salmon – southern resident orcas' main source of prey – and disruptions from boating traffic have been linked to a downturn in the region's orca population over the past 30 years. "We will continue to assess the effects of fisheries on southern resident killer whales as we move towards setting our final fishing seasons in April," Adicks said. Fisheries may close early if quotas have been met. For more details about the options, visit PFMC's webpage at https://www.pcouncil.org/blog/, where information can be found about a March 25 public meeting in Westport on the three alternatives for ocean salmon fisheries. Chinook and coho quotas approved by the PFMC will be part of a comprehensive 2019 salmon-fishing package, which includes marine and freshwater fisheries throughout Puget Sound, the Columbia River and Washington's coastal areas. State and tribal co-managers are currently developing those other fisheries. Several additional public meetings are scheduled in March and April to discuss regional fisheries issues. The public will also soon be able to comment on proposed salmon fisheries through WDFW's website at https://wdfw.wa.gov/fishing/northfalcon/, where a list of scheduled public meetings can be found. OLYMPIA – Fishery managers estimate higher numbers of coho salmon will return to Washington’s waters in 2019 compared to last year, but expect low returns of wild chinook will again make setting fishing seasons a challenge. The forecast meeting marks the starting point for crafting 2019 salmon-fishing seasons in Puget Sound, the Columbia River and Washington coastal areas. The annual process for setting salmon fisheries is known as "North of Falcon." Fishery managers have scheduled a series of public meetings through early April before finalizing seasons later that month. Meanwhile, this year's run of pink salmon, which mostly return to Washington's waters only in odd-numbered years, is expected to be 608,400 fish. That’s roughly 10 percent of the 10-year average of 5.7 million fish. A meeting schedule, salmon forecasts, and information about the salmon season-setting process are available on WDFW's website at https://wdfw.wa.gov/fishing/northfalcon/. Ocean options: State, tribal and federal fishery managers will meet March 7-12 in Vancouver, Wash., with the Pacific Fishery Management Council (PFMC) to develop options for this year's commercial and recreational ocean chinook and coho salmon fisheries. The PFMC establishes fishing seasons in ocean waters three to 200 miles off the Pacific coast. Regional discussions: Additional public meetings have been scheduled into April to discuss regional fishery issues. Input from these regional discussions will be considered as the season-setting process moves into the "North of Falcon" and PFMC meetings, which will determine the final 2019 salmon seasons. Final PFMC: The PFMC is expected to adopt final ocean fishing seasons and harvest levels at its April 11-15 meeting in Rohnert Park, Calif. The 2018 salmon fisheries package for Washington's inside waters is scheduled to be completed by the state and tribal co-managers during the PFMC's April meeting. Beginning in mid-March, fishery proposals will be posted on WDFW's website at https://wdfw.wa.gov/fishing/northfalcon/, where the public can submit comments electronically. OLYMPIA – State fishery managers have scheduled a variety of opportunities for the public to participate in setting salmon fishing seasons for 2019, starting with the annual statewide salmon forecast meeting Wednesday, Feb. 27. The Washington Department of Fish and Wildlife (WDFW) will present initial forecasts compiled by state and tribal biologists of the 2019 salmon returns at the meeting scheduled from 9 a.m. to 3 p.m., at the Lacey Community Center, 6729 Pacific Ave. S.E., Olympia. Online comments: Beginning in mid-March, fishery proposals will be posted on WDFW's website at https://wdfw.wa.gov/fishing/northfalcon/, where the public can submit comments electronically. Plenary session: State and tribal co-managers plan to hold an informal discussion during the public meeting, Wednesday, April 3, in Lynnwood. Details will be available on the webpage listed above. Meetings on video: The department intends to provide video of several public meetings. More information will be available online soon. The annual process of setting salmon fishing seasons is called "North of Falcon" and is held in conjunction with public meetings conducted by the Pacific Fishery Management Council (PFMC). The council is responsible for establishing fishing seasons in ocean water three to 200 miles off the Pacific coast. These halibut season dates are preliminary until adopted into federal regulation by the National Marine Fisheries Service but can be used for planning purposes, as they are unlikely to change. Please note, Pacific halibut are managed to a quota and openings are dependent on available quota. If sufficient quota remains after the all-depth fishery has closed, the northern nearshore area will open on the following Saturday. When quota is available, the nearshore area will be open 7-days per week until the remaining quota is taken. In all marine areas open to halibut fishing, there is a one-fish daily catch limit and no minimum size restriction. There is a four fish annual bag limit. Anglers must record their catch on a WDFW catch record card. Check for additional information as the season progresses in the Emergency Rules website. 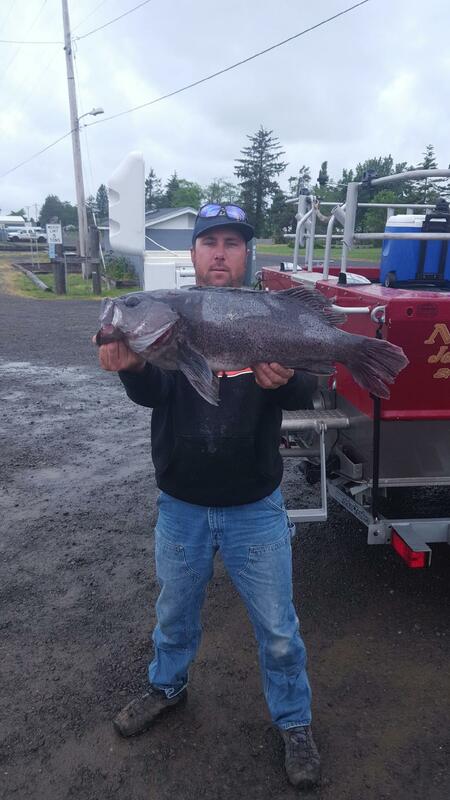 OLYMPIA – Steven Charles Orr of Rochester, Washington, has set a new state record for the largest black rockfish caught in Washington state waters, the Washington Department of Fish and Wildlife (WDFW) confirmed today. The 10.72 pound fish measured 26.15 inches and was caught May 15 in Marine Area 1 near Ilwaco, Pacific County, while Orr was bait fishing with herring. "I thought I had a ling cod," Orr said. "It was like fighting a big king salmon, and when I got it up to the boat, it absolutely dwarfed a 6 to 7 pound sea bass we had onboard. It was definitely a fighter." The new record exceeded the previous black rockfish record by almost half a pound. That record was held by Joseph Eberling for a fish he caught in the Tacoma Narrows area of Puget Sound in 1980. Some of Washington's most popular fishing opportunities are open to anglers this month, including chinook salmon in the Columbia River and trout in rivers throughout the state. Sound like fun? Prospective anglers who are interested in fishing but don't have a fishing license can get in on the action during Free Fishing Weekend, scheduled June 10-11. During those two days, no license will be required to fish or gather shellfish in any waters open to fishing in Washington. In addition, no vehicle access pass or Discover Pass will be required to park that weekend at any of the 700 water-access sites maintained by the Washington Department of Fish and Wildlife (WDFW). For more information, check the department's website at http://wdfw.wa.gov/fishing/free/. Trout: Many rivers across the state open for trout fishing June 3. Meanwhile, the lowland lakes fishing season is underway and anglers have plenty of opportunities to reel in some nice-size fish over the next several months. Columbia River salmon: The summer salmon season begins June 16 as hefty upriver summer chinook salmon and sockeye salmon begin moving in increasing numbers into the Columbia River. Lake Roosevelt sturgeon: For the first time in about 30 years, Lake Roosevelt is open for white sturgeon fishing. Check the Eastern Washington (Region 1) report for details. 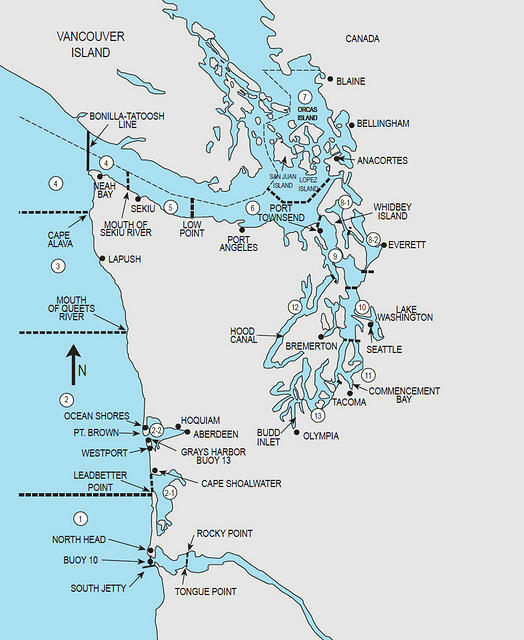 Puget Sound salmon: Salmon fishing seasons are open in southern Puget Sound (marine areas 11 and 13). Bird watching: June is a great month to view birds in Washington, particularly at WDFW wildlife areas east of the Cascades. Puget Sound crab: State shellfish managers are working to finalize this year's Puget Sound crab fisheries and hope to announce season information soon. Check the department's recreational crab fishing webpage (http://wdfw.wa.gov/fishing/shellfish/crab/) for updates. For more information about fishing and wildlife viewing opportunities available this month, see the Weekender Regional Reports posted on WDFW's website at http://wdfw.wa.gov/weekender/. These reports are updated throughout the month to provide up-to-date information about recreational opportunities around the state. OLYMPIA – Each year, thousands of Washingtonians go fishing – legally – without a license on "Free Fishing Weekend," scheduled for June 10-11. During those two days, no license will be required to fish or gather shellfish in any waters open to fishing in Washington state. "If you haven't fished in Washington, or want to introduce fishing to someone new to the sport, this is the weekend to get out there," said Steve Thiesfeld, WDFW inland fish program manager. For tips, new anglers should check online for the "Fish Washington" feature at the department's homepage (http://wdfw.wa.gov). The site provides details on lowland lake fishing, high lake fishing and marine area opportunities. For those planning fishing vacations, Great Washington Getaways (http://wdfw.wa.gov/fishing/vacation) showcases some of the state's best family travel and fishing opportunities. And, for those who want even more fishing advice, the Fish Washington video page (http://wdfw.wa.gov/fishing/washington/videos) provides "how to" fishing videos designed to introduce techniques to both new and seasoned anglers. Anglers who take part in free fishing weekend can also participate in the department's 2017 Trout Fishing Derby and redeem tags from fish caught over the weekend. Interested anglers should check for details online at http://wdfw.wa.gov/fishing/derby.